The White House is “very concerned” over tensions surrounding Jerusalem’s Temple Mount complex, it said in a statement late Wednesday, urging Israel and Jordan to restore calm to the area after days of violent clashes. 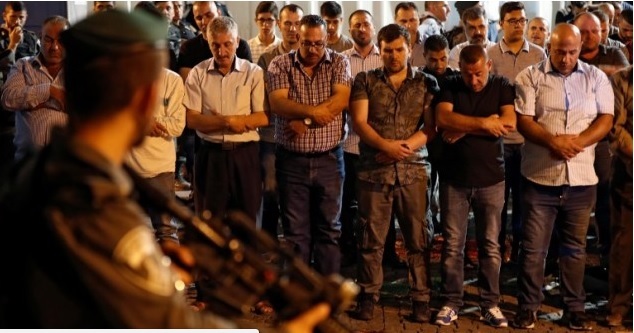 Muslim worshipers have been protesting Israel’s decision to install metal detectors and other security measures at entrances to the holy site in the wake of a deadly terror attack near there on Friday, saying the move breaks the delicate status quo agreement between Jerusalem and Amman. “The United States is very concerned about tensions surrounding the Temple Mount/Haram Al-Sharif, a site holy to Jews, Muslims, and Christians, and calls upon the State of Israel and the Hashemite Kingdom of Jordan to make a good faith effort to reduce tensions and to find a solution that assures public safety and the security of the site and maintains the status quo,” the White House press office said in a brief statement. On Wednesday, rioters clashed with Israeli police at sites around Jerusalem as part of a “day of rage” called to protest the metal detectors, the fourth straight day of violence stemming from the move. Metal detectors were set up in front of entrances to the Temple Mount as part of increased security measures Sunday after police said three Arab-Israeli attackers who emerged armed from the compound and shot dead two police officers just outside on Friday had stashed their weapons on the holy site. Waqf officials have boycotted the site in protest and have called on other Muslims to do the same. Several clashes have broken out following protest prayers next to the metal detectors. Officials are worried that tensions may come to a head on Friday — the Muslim holy day — should the metal detectors remain in place. Prime Minister Benjamin Netanyahu, in Hungary on a state visit, said Wednesday he held security consultations with police and defense officials, but decided to leave the detectors. “We want to solve this crisis in the quietest way possible and to bring back the calm,” Netanyahu said. “We talk with the Arab world and we explain that there is absolutely no change to the status quo” on the holy site. Under the status quo governing the site, Israel controls access to the site and the Waqf Islamic trust set up by Jordan administers activities inside the compound. Non-Muslims are allowed to visit but are prohibited from prayer. Jordanian Foreign Minister Ayman Safadi said the key to restoring calm is to have Israel respect the “historic and legal status” at the shrine, the state news agency Petra reported. Safadi told ambassadors from Europe and Asia that ending tensions is in the hands of Israel which he said should immediately reopen the shrine without any hindrances. Palestinian President Mahmoud Abbas, who was in China, is returning to the West Bank to deal with the crisis, his office said in a statement. In the meantime, Abbas is in touch with Arab and international leaders to try to “prevent a deterioration of the situation,” it said. Israel is in talks with Jordan over the situation, according to the Waqf. “We are in communication with the Jordanian government which is in contact with the government of Israel,” the director of the Waqf, Sheikh Azzam al Khati, said. “As is known, security has always been in the hands of Israelis. But for us, we will not accept any changes, even for security,” he said. On Saturday night, Jordan’s King Abdullah spoke to Netanyahu and condemned the attack. According to the official Petra News Agency, the Jordanian king slammed those who “undermine security and stability” and pave the way for further violence, in an apparent reference to the Arab Israeli gunmen. In the wake of the attack, the White House backed Israel’s decision to close the Temple Mount, the first time it had been shuttered on a Friday in decades. “We urge all leaders and people of good faith to be understanding as this process proceeds and reaches its conclusion,” the White House said then.